Give each party guest a handmade Flower Lei when they arrive using the colourful, Paradise Crush papers! 1.Use a compass to draw circles sizing at approximately 6cm. Choose a variety of paper designs to make the lei really colourful, and cut out. 2.Carefully fold the circles you have cut out in half and then in half again. 3.Cut a curve at the top of your folded circle as this will give you the appearance of a flower when you unfold it. 4.Alternatively, you could create a different look by cutting a fringe along the edge. 5.Unfold your flowers and scrunch each one to add shape and dimension. 6.Cut a selection of leaf shapes to add to your lei to alternate the design! Pierce each flower with a hole in the middle and add a hole to the top of each leaf. 7.Thread a needle with a length of Dovecraft Twine and begin threading your flowers and leaves through ensuring to thread each one twice as this will help you create shape on your garland. Add all your flowers and leaves and tie the ends together to finish the lei! Give your balloons character by using our fab, flamingo template! Print out our template, cut out the shapes, draw around them onto the back of your chosen Paradise Crush papers and cut out. Blow up your balloon and adhere the head, wings and feet to the balloon with Dovecraft Perma Fix tape! These will look fantastic hung up in your home! For a centre piece, why not create a family of pineapple pinecones! Paint your pinecone with layer of DecoArt Outdoor Fiesta Yellow Patio Paint and leave to dry. Cut a 18cm x 4.5cm strips of green, First Edition Textured Card and horizontally, cut out v shapes along the strip to make the leaves. Roll the strip together and secure it with Dovecraft Perma Fix tape. Pull out the leaves and once you’re happy with its’ appearance, adhere it to the pinecone with Dovecraft Perma Fix Tape. Die cut a pair of sunglasses from the First Edition Seaside die set onto a black and coloured sheet of Dovecraft foam. Fill the gaps of the sunglasses with the black foam die cuts and glue your sunglasses to the pinecone! Alternatively, you could decorate a selection of tropical fruits with these First Edition Sunglasses die cuts to give each one a little burst of character! Get into the party spirit by decorating your cocktails and cakes with a selection of Paradise Crush umbrellas! Simply cut out a large and small circle from your First Edition Paradise Crush paper pad, evenly score lines around each circle, from the centre to the edge. Add a crimping effect around their edge with scissors and add a hole to the centre of the large circle. Finish by adhering a small piece of Dovecraft Perma Fix tape to the top of the cocktail stick, placing your large circle to the stick and then layering a smaller circle on top to add dimension and interest. Create a stand out banner using the We R Memory Keepers Alphabet board. It’s so easy to use and you can create a professional looking banner in ten minutes! Alternatively, you can cut out each letter from a First Edition Paradise Crush 12x12 paper pad ensuring to use different paper designs to make your banner really pop! Finish by adhering each letter to a length of Dovecraft Twine with Dovecraft Perma Fix tape. 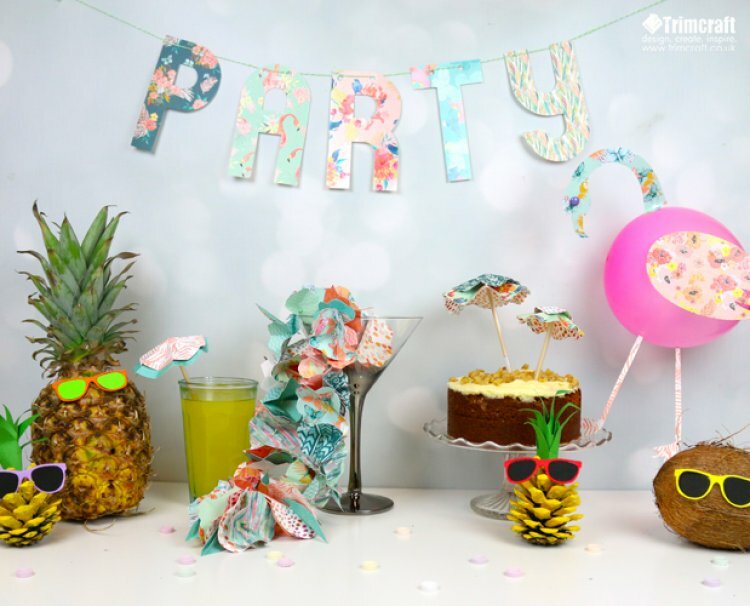 There you have it, tropical themed party decorations all made by hand with very few products! How will you use the Paradise Crush papers to decorate your summer party? We would love to see your inspired makes so remember to upload them to the project gallery and to #trimcraft!